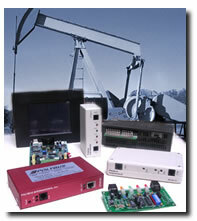 Our line of keygens provide modbus compatible communication capabilities for Siemens S7 micro PLC's and the S5-95U PLC. Keygens allow the PLC to communicate with a variety of SCADA and host CPU systems via radio, modem or general EIA232 interfaces. S7-214 Keygen Package, 1200 to 9600 baud, Radio/RS-232 and Point-to-Point. S7-216 Keygen Package, 1200 to 9600 baud, Radio/RS-232, Point-to-Point, Dial-out and Paging. S7-224 Keygen Package, 1200 to 9600 baud, Radio/RS-232, Point-to-Point, Dial-out and Paging. S7-226 Keygen Package, 1200 to 9600 baud, Radio/RS-232, Point-to-Point, Dial-out and Paging. S5-95U Keygen Package, 1200 to 9600 baud, Radio/RS-232 and Point-to-Point. Our line of modems provide Modbus compatible communication capabilities for Siemens S7 micro PLC's and the S5-95U PLC. Keygens allow the PLC to communicate with a variety of SCADA and host CPU systems via radio, leaseline, audio or general EIA232 interfaces.